A suspected acoustic attack on US embassy staff in Cuba was reported as recently as last month, US officials have revealed. The US State Department also said the number of staff who have reported health problems had increased to 19. However, the affair was first reported in August when the US expelled two Cuban diplomats from Washington. 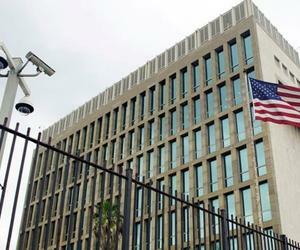 Officials said the expulsions were in protest at Cuba's failure to protect its diplomats. Sonic devices may have been used to emit inaudible sound waves that can cause deafness, US media suggest. On Friday, the US government confirmed that an incident took place as recently as August and that the number of staff reporting problems had increased. "We can't rule out new cases as medical professionals continue to evaluate members of the embassy community," state department spokeswoman Heather Nauert said. "Diagnoses include mild traumatic brain injury and permanent hearing loss, with such additional symptoms as loss of balance, severe headaches, cognitive disruption and brain swelling," it said. It urged the government to do everything possible to help those affected and to "ensure that these incidents cease and are not repeated". The statement is the first time that the hearing loss has been described as permanent. It is understood that "mild traumatic brain injury" could include concussion or headaches.